Synopsis: Marcus Luttrell and his team set out on a mission to capture or kill notorious Taliban leader Ahmad Shah, in late June 2005. Marcus and his team are left to fight for their lives in one of the most valiant efforts of modern warfare. Review: “Holy moly.” That’s what I found myself instinctively saying out loud several times during Lone Survivor, a taut war film that brings its audience along for a bone crunching journey along its razor’s edge of a true life tale. 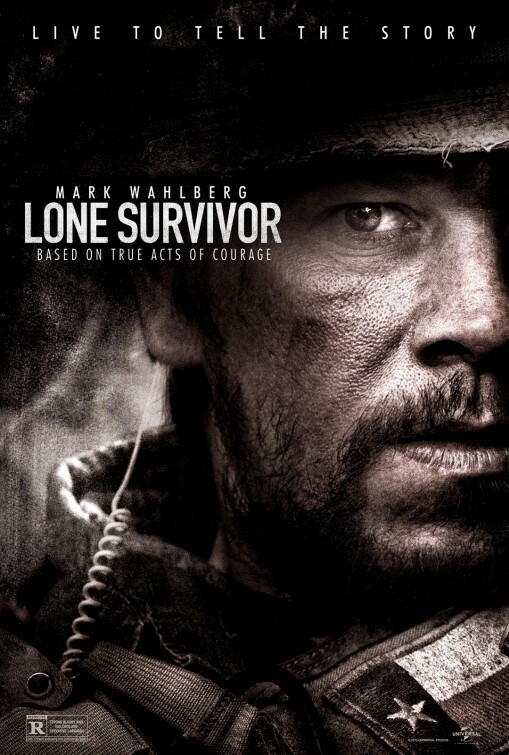 I wasn’t sure what to make of Lone Survivor when early trailers were released. I’ve grown wary of war films after years of similarly themed cinematic excursions both fictional and documentary-like that I just couldn’t fathom that this film, directed by Battleship helmer Peter Berg and starring Mark Wahlberg, would have anything new to bring to the battlefield. Just goes to show that you shouldn’t judge a book by its cover; or in this case judge a film by its marketing materials. Berg opens the film with images from the limit-testing training that United States Navy SEALs undergo to take their place alongside the brave men and women serving our country. It’s an eye-opening and pulse raising start, illustrating in no uncertain terms that only the best of the best make it through. As the action transfers to a military base, we’re introduced to the members of the team of Operation Red Wings, tasked to track a high ranking dangerous Taliban leader. Leading the team is Lieutenant Michael Murphy (Taylor Kitsch, John Carter, Savages), he’s joined by Danny Dietz (Emile Hirsch, Killer Joe, The Darkest Hour), Matthew “Axe” Axelson (Ben Foster, Contraband), and Marcus Luttrell (Wahlberg, Ted, Pain & Gain) who wrote the book (along with Patrick Robinson) on which Berg adapted his screenplay from. Comrades and brothers, this recon and surveillance team is a well oiled machine venturing into no man’s land with an important mission. It’s not long before one wrong (but I suppose morally right) decision tosses the men into the path of mortal danger…leading to a middle section that puts the audience through a white knuckle gauntlet. So many war films make the mistake of favoring jittery camera work to establish chaos but Berg and cinematographer Tobias Schliessler play against this and let their staging of these combat scenes tell the story instead. There are several skillfully crafted heart pounding passages as the soldiers come face to face with their enemy and their own mortality. Having already won a SAG Award for their work, special mention must be made again to the stunt performers on the film…with two sequences involving falling down the sheer edge of a mountain you’ll be wincing with each somersault/tumble. Though the title gives the ending away, it doesn’t lessen the impact the film or its characters have on us. Even when the film dips into standard stylized action fare in the last act there’s an underlying message of salvation to be had by everyone involved. Berg has cast the film so well that he doesn’t need to coax committed performances out of anyone onscreen. All four actors could have headlined the picture but Wahlberg again shows he’s light years away from his Funky Bunch days by turning in a layered rendering of Luttrell. I expected the film to end with a dedication to the men who lost their lives but wasn’t prepared for how much of an emotional force it would have on me. Berg and company have approached this material with the utmost respect for the bravery of those that put their lives on the line for their country and have delivered a superior war film that doesn’t glorify, grandstand, or proselytize… It’s a better film that I ever would have thought it would/could be – and comes highly recommended.